Several years ago, MFT found itself in the unique position of having been given over one hundred pieces of valuable artwork by the late artist and conservationist Joseph A. Fiore (1925-2008) – for the sole purpose of re-gifting these pieces to educational and environmental organizations throughout Maine. 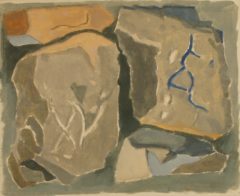 The paintings and drawings were part of Fiore’s “Geological Works,” also known as the “Rock Paintings,” and were collectively valued at approximately $1.3 million. During his lifetime, Joseph Fiore was an avid supporter of Maine Farmland Trust. 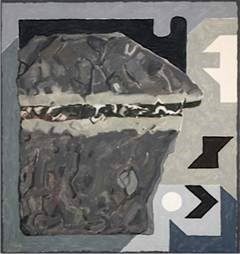 A former Black Mountain College student and teacher, Fiore was a well-known avant-garde artist during the 1960s. An artist friend and contemporary of Lois Dodd and Alex Katz, Fiore divided his life between New York City and Jefferson, Maine. While Fiore is best known for his abstract compositions, his key inspiration was always the natural world – and this is where his heart lay. Fiore’s family created a foundation after he passed in 2008. 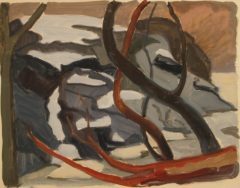 From 2012 onward, the Falcon Foundation donated many of Fiore’s landscape works to MFT—owing to the artist’s longstanding commitment to the Trust and the fact that MFT runs a gallery that combines art and environment, paralleling the artist’s own passions. 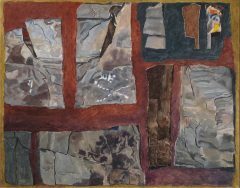 Recently, Maine Farmland Trust completed the re-gifting of the Rock Paintings, which now reside with fifty non-profits throughout the state of Maine, and beyond. Among the recipients are such organizations as Bates College, Colby College, College of the Atlantic, St. Joseph’s College, Unity College, Bay Chamber Concerts, DaPonte String Quartet, American Farmland Trust, Blue Hill Heritage Trust, Cape Elizabeth Land Trust, Damariscotta River Association, Island Heritage Trust, Midcoast Conservancy, Maine Organic Farmers and Gardeners Association, Penobscot East Resource Center, Wolfe’s Neck Farm, Kieve-Wavus Education Inc., Hurricane Island Center for Science & Leadership, Haystack, Gibbs Library, Skidompha Library, Vose Library, and many more Maine non-profits doing important work. A full list of recipients can be found on MFT’s website: https://www.mainefarmlandtrust.org/public-outreach-new/jaf-art-center/fiore-art-trail/. This page actually offers a “Fiore Art Trail,” giving an overview of all the places in Maine where Fiore’s art can be found, along with opening times of organizations which offer public access. There is even a day trip suggestion complete with locations of delicious eateries along the way. 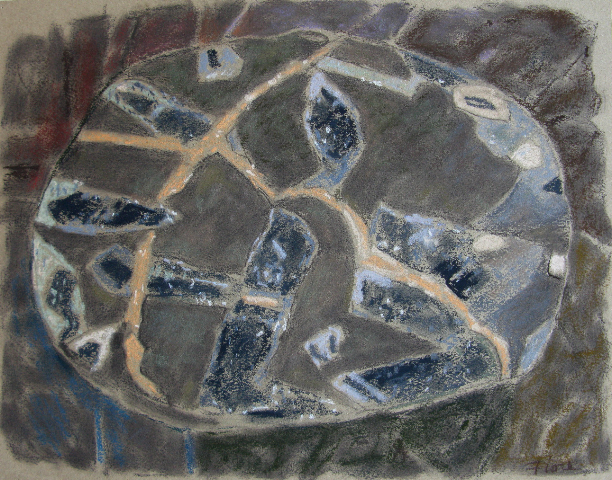 MFT itself has two locations where Fiore’s art can be seen – in this case, not only Rock Paintings, but also landscapes and abstract works: MFT Gallery, 97 Main Street, Belfast (open M-F, 9-4); and the Joseph A. Fiore Art Center, 152 Punk Point Rd, Jefferson (open to the public June – September, on Saturdays from 12-4).